For carrying out section 301 and title IV of the PHS Act with respect to drug abuse, $864,998,000. Program funds are allocated as follows: Competitive Grants/Cooperative Agreements; Contracts; Direct Federal/Intramural and Other. Substance use and its consequences take an enormous toll on our nation. The combined healthcare, crime-related, and productivity costs of tobacco, alcohol, and illicit drugs exceed $700 billion a year, but dollars only poorly approximate the devastating human cost of substance use disorders.1,2,3,4,5,6 Drug use and addiction present complex and continuously evolving challenges currently dominated by an ongoing crisis of opioid misuse and related overdoses; new synthetic drug trends as well as new delivery systems such as e-cigarettes and vaporizers that are changing how people use drugs; and by rapidly changing state policies and social norms related to marijuana. The National Institute on Drug Abuse (NIDA) strives to meet these challenges by strategically supporting and conducting basic and clinical research on drug use, its consequences, and the underlying neurobiological and behavioral mechanisms involved, and by working with federal and community partners to support the effective translation and implementation of scientific research findings to improve the prevention and treatment of SUDs. Drug use and addiction are mediated by many biological, environmental, social, and developmental factors. A more detailed understanding of how these factors interact and contribute to addiction risk is critical for developing better prevention and treatment strategies. NIDA supports a robust portfolio of basic research to understand the mechanisms that underlie the transition from drug use to addiction. This research has led to dramatic progress in our understanding of the brain circuits involved in addiction. For example, new technologies for ‘tracing the relationship between input and output’ (TRIO method) have enabled scientists to delineate the flow of information through reward circuits and identify previously unknown brain circuits.7 This research has revealed the complexity of reward circuits, identifying specific subtypes of dopamine neurons in two distinct brain regions that mediate reward versus aversion. Both types of dopamine neurons receive diverse input from other areas of the brain, allowing for precise, nuanced control of the activity of these circuits which could help explain the role of diverse biological, social, and behavioral factors that mediate risk for addiction. Other recent research has identified competing brain circuits that control the transition between goal-directed and habitual behaviors.8 Cannabinoid receptors were found to influence the activity of these circuits which may explain changes in motivation and drive that have been described in people with cannabis use disorders. A deeper understanding of the brain circuits that mediate addiction-related behaviors allows researchers to identify new targets for treatment that address the specific neurobiological drivers of addiction. Another illustrative example of basic research is the Adolescent Brain Cognitive Development (ABCD) study, the largest long-term study of brain development and child health in the U.S. Recruitment began in September 2016 for this landmark study led by NIDA in partnership with nine other NIH institutes and offices and the Centers for Disease Control and Prevention (CDC). Researchers will follow the biological and behavioral development of more than 10,000 children beginning at ages 9-10 into early adulthood and use advanced brain imaging, interviews, and behavioral testing to determine how childhood experiences, including drug use, interact with a child’s changing biology to affect brain development and—ultimately—social, behavioral, academic, and health outcomes. The most effective way of addressing substance use disorders is preventing them from developing. However, despite strong evidence supporting the effectiveness of prevention strategies targeted to both individuals and communities, relatively few effective interventions have been widely adopted or faithfully implemented, and thus their public health impact has been limited. NIDA therefore supports implementation research on the complex processes through which evidence-based interventions are adopted, implemented, and sustained, with a focus on devising empirically-driven strategies for increasing their impact on public health. In addition, the growing understanding of the neurobiological and developmental factors that influence risk and resilience for substance use disorders is allowing researchers to design prevention interventions that target not only behavior but also brain development and function – such as the hormonal stress responses. For example, maltreated children in foster care receiving prevention interventions not only showed improved behavioral functioning (increasing the likelihood of successful transition into permanent homes) but also better stress hormone regulation, and stronger brain connectivity that is approaching that of children in the general population.9,10 NIDA is working to foster an era when neurodevelopment can be directly targeted through prevention science. The second strategy for accelerating treatment development is to translate basic knowledge of neurobiology of addiction to develop new approaches that modulate specific molecular targets and brain networks. In this context, novel therapeutic approaches include pharmacotherapies as well as non-pharmacological interventions, such as biologics (e.g., vaccines, immunotherapies, peptides), transcranial magnetic stimulation (TMS), deep brain stimulation, and neurofeedback, which modify the activity of specific brain regions—and thus, may have fewer adverse effects. For example, TMS decreased smoking in a clinical trial of 115 cigarette smokers with 33 percent of patients receiving high-frequency (10Hz) TMS achieving sustained abstinence (for 6 months) compared to nine percent in the placebo group. In addition, a collaboration between NIDA’s intramural research program and researchers in Italy recently reported that TMS reduced cocaine use and cocaine cravings in a group of 32 patients with cocaine addiction.12,13 Follow-up studies are being planned, and ongoing research is exploring the use of TMS to treat of pain, opioid misuse, and nicotine addiction. Overall Budget Policy: The FY 2018 President’s Budget request is $865 million, a decrease of $210 million compared with the FY 2017 Annualized CR level. These reductions are distributed across all programmatic areas and basic, epidemiolgy or clinical research. Neuroscience and Behavior: The Neuroscience and Behavior portfolio seeks to expand our understanding of the fundamental neurological, genetic/epigenetic, and behavioral processes that underlie SUDs. Central to this goal are efforts to tease apart the multiple factors that contribute to drug use and addiction risk, with particular attention to individual differences in risk and responses to drugs. In addition, and in line with the goals of the President’s Brain Research through Advancing Innovative Neurotechnologies (BRAIN) Initiative, we are working to expand our basic understanding of the brain from the molecular to the behavioral level. NIDA is supporting research to develop advanced technologies that improve our ability to study the organization and function of the living brain that will help us to better understand the interactions of complex neural circuits including those that mediate reward, aversion to drug effects, and related decision making; and develop novel strategies to therapeutically influence SUD-relevant brain circuits including TMS, tDCS, DBS, and neurofeedback. Other key projects are investigating the effects of drugs on the expression of genes (measured through the expression of ribonucleic acid (RNA) and protein) and brain development and function; the interactions of an individual’s genes with environmental conditions, such as stress and early exposure to drugs, that influence risk for addiction; the role of epigenetic changes, or chemical modification to DNA that can influence long-term patterns of gene expression in specific brain cells (neuron and glia) without changing DNA sequence; basic processes underlying resilience against SUDs in childhood and adolescence; and exploring gender-related differences in these effects. NIDA is also working to develop the capacity to support big data science to promote efficient analysis of large, diverse data sets on a scale not previously possible. Collectively, this research will provide new perspective on effects of drugs on multiple biological systems to improve our understanding of the basic neural and genetic mechanisms that underlie drug use and addiction. In September 2016 recruitment began for the Adolescent Brain Cognitive Development (ABCD) study, the largest long-term study of brain development and child health in the United States. This landmark study will follow the biological and behavioral development of more than 10,000 children beginning at ages 9-10 through adolescence into early adulthood. Recruitment will be done over a two-year period through partnerships with public and private schools near twenty-one research sites across the country as well as through twin registries. Adolescence is a time of extraordinary physical, emotional, and intellectual growth as well as a changing social environment full of new challenges and opportunities that help shape a young person’s health and well-being. There is much to learn about how adolescent experiences, including experimentation with alcohol, tobacco, marijuana, or other substances as well as participation in extracurricular activities – playing video games, sleep habits, head injuries, etc. – affect development and vice-versa. During the course of the next decade, scientists will use advanced brain imaging, interviews, and behavioral testing to determine how childhood experiences interact with each other and with a child’s changing biology to affect brain development and—ultimately—social, behavioral, academic, health, and other outcomes. Understanding these relationships may help reveal the biological and environmental building blocks that contribute to successful and resilient young adults. This enhanced knowledge also may lead to ways to predict potential developmental problems including mental illness and SUD so that they can be prevented or reversed. Families that volunteer will be part of groundbreaking research that promises to inform future substance use prevention strategies, educational priorities, child development innovations, research priorities, and more effective public health interventions. The ABCD study is supported by NIDA, the National Institute on Alcohol Abuse and Alcoholism (NIAAA), the National Cancer Institute (NCI), the Eunice Kennedy Shriver National Institute of Child Health and Human Development (NICHD), the National Institute of Mental Health (NIMH), the National Institute on Minority Health and Health Disparities (NIMHD), the National Institute of Neurological Disorders and Stroke NINDS), the NIH Office of Behavioral and Social Sciences Research (OBSSR), the Office of Research on Women’s Health, and the Division of Adolescent and School Health at the CDC. For more information about this landmark study, please visit its website at www.ABCDStudy.org. Epidemiology, Services, and Prevention Research: This NIDA Division supports integrated approaches to understand and develop strategies to address the interactions between individuals and environments that contribute to drug use and related problems. With a focus on research to inform public health, the Division supports large surveys – such as the annual Monitoring the Future survey, which tracks drug use and related attitudes among teens – and surveillance networks to monitor issues and trends locally and nationally. NIDA’s National Drug Early Warning System (NDEWS) monitors emerging trends related to illicit drug use, including designer synthetic compounds and fentanyl, around the country so that rapid, informed, and effective public health responses can be developed and implemented precisely where and when they are needed. The Division also supports research related to more effectively integrate prevention and treatment services into healthcare and community systems. For example, NIDA research is exploring treatment of SUDs in the criminal justice system, including studies on implementation of medication-assisted treatment (MAT) and seek, test, treat, and retain (STTR) strategies for people with SUDs at risk for HIV. NIDA also funds research into the efficacy of screening brief intervention and referral to treatment (SBIRT) in primary care settings for reducing drug use and SUD. Program efforts also focus on research to optimize implementation of evidence-based prevention interventions and treatment services in real-world settings. NIDA also supports research to better understand the impact of policy changes related to substance use and addiction including implementation of parity regulations, new payment and integrated care models, and changes in State policies related to marijuana. Current research is examining the impact of healthcare system changes on access to quality treatment for persons with SUDs, as well as associations between changes in State marijuana policies and trends in use and related health consequences and educational outcomes, particularly for adolescents and young adults. This research is intended to inform policy making to improve prevention and treatment interventions. The misuse of and addiction to opioids including prescription pain medications and heroin is a serious national problem that resulted in over 28,000 overdose deaths in 2014.14 An estimated 2 million people in the U.S. suffered from SUD related to prescription opioids in 2015 and 591,000 suffered from a heroin use disorder.15 This issue has become a public health epidemic with devastating consequences including not just increases in opioid use disorders and overdose deaths, but also the rising incidence of newborns who experience neonatal abstinence syndrome because their mothers used these substances during pregnancy; the increased spread of infectious diseases including HIV and hepatitis C (HCV), as was seen in 2015 in southern Indiana, as well as the rise in infectious endocarditis16 associated with injection drug use. NIDA is working closely with our federal partners on activities related to the five HHS opioid-related priorities17: strengthening public health surveillance, advancing the practice of pain management, improving access to treatment and recovery services, targeting availability and distribution of overdose-reversing drugs, and supporting cutting-edge research.NIDA’s efforts include funding centers of excellence to create educational curriculum for clinicians on pain and SUD treatment and disseminating research findings related to opioid prescribing, overdose reversing drug distribution programs, and effective implementation of medication assisted treatment in primary care, emergency departments, and specialty treatment programs. In addition, NIDA is supporting research to develop more effective pain treatments with reduced potential for misuse and diversion; to develop improved strategies for implementation of evidence based practices for the treatment of opioid use disorders, including medication assisted treatment; and to develop strategies to minimize overdose risk among high risk patients (those on high doses of opioids, with comorbid pulmonary diseases, or who have experienced a previous overdose). Our efforts also include implementation research in rural communities. An example is NIDA’s funding of one-year services planning and needs assessment research grants to provide the foundation for future intervention programs and larger scale research efforts to test interventions to address opioid misuse in a rural areas. Four grants were awarded in FY 2016 that will address issues related to injection drug use and associated transmission of infectious disease as well as the coordination of care for prisoners with opioid use disorders as they re-enter the community. A second funding opportunity announcement in partnership with SAMHSA, CDC, and ARC was released in October 2016 to support comprehensive, integrated approaches to prevent opioid injection and its consequences, including SUD, overdose, HIV and hepatitis C, as well as sexually transmitted diseases. These projects will work with state and local communities to develop best practices that can be implemented by public health systems in the Nation’s rural communities. Therapeutics and Medical Consequences: NIDA’s Division of Therapeutics and Medical Consequences is focused on developing therapeutics for the treatment of SUDs. Since the pharmaceutical industry has traditionally made limited investment in the development of medications to treat SUDs, this is a strategic priority for NIDA. To most effectively leverage NIDA resources, this program encourages the formation of alliances between strategic partners (pharmaceutical and biotechnology companies as well as academic institutions) with the common goal of advancing medications through the development pipeline toward FDA approval in a timely manner. NIDA conducts research to decrease the risks associated with medications development to make it more appealing for pharmaceutical companies to complete costly phase IIb and III clinical studies. An example of such a project is a partnership with AstraZeneca to explore a novel medication that modulates the activity of glutamate – an neurotransmitter that excites brain cells – to treat drug addiction. Preclinical studies with this class of molecule indicate that it could be effective for treating nicotine and cocaine use disorders. Another example is the partnership with Lightlake Pharmaceuticals and Adapt Pharma that led to the successful development of Nasal Narcan®, the only FDA approved intranasal naloxone product to treat opioid overdose. Further, US World Meds, funded in part through NIDA grants, is in late stage development of lofexidine, a medication for the treatment of opioid withdrawal symptoms that might also hold promise for the treatment of other addictions. NIDA has also invested in research supporting the development of vaccines and monoclonal antibodies for the treatment of SUDs. For example, an ongoing collaboration with Selecta Biosciences is working to develop a novel nicotine vaccine and another with Intervexxion Therapeutics is working to develop a monoclonal antibody to treat methamphetamine addiction. The latter program is currently in clinical trials. While available pharmacotherapies have represented significant advances in the ability to treat SUDs, the efficacy of these medications is far from ideal, and there are no approved medications to treat cocaine, methamphetamine, or cannabis use disorders. One approach NIDA is taking to accelerate development of new treatments for SUDs is to support development of non-pharmacological interventions, including biologics – such as vaccines, monoclonal antibodies, and bioengineered enzymes designed to prevent a drug from entering the brain – and novel brain stimulation techniques – such as TMS and transcranial direct current stimulation (tDCS), that target brain circuits impaired in addiction with improved specificity, and thus, with less adverse effects. Preclinical studies have shown that biologics can be effective in both facilitating abstinence and preventing reinstatement of drug use. The results from early clinical trials – testing vaccines for nicotine, cocaine, and opioids – have been mixed and have highlighted the need to improve the magnitude and duration of the post-immunization antibody response to generate more effective vaccines. NIDA is supporting ongoing research to develop and test next generation vaccines to treat cocaine, nicotine, methamphetamine, and opioid addictions by modifying the vaccine design to generate stronger immune responses. NIDA is also investing in the development of synthesized antibodies that may overcome the challenges in achieving effective antibody titers after vaccination by allowing for the direct delivery of high doses of anti-drug antibodies which bypass the patient’s immune system allowing for more precise dosing. An antibody developed for treatment of methamphetamine addiction, ch-mAb7F9, was shown to be safe and well tolerated in an initial Phase I study,18 and NIDA is currently funding Phase Ib studies. Another promising area of biologics research is in bioengineered enzymes designed to increase the rate at which a drug is metabolized in order to reduce the amount of active drug reaching the brain. Clinical studies have demonstrated the feasibility of using modified enzymes to treat cocaine intoxication and cocaine use disorders. While results from a phase II clinical trial of TV 1380 found only non-significant trends toward increased cocaine abstinence, they suggested that similar enzymes with greater activity may have potential for the treatment of cocaine addiction.19 Ongoing studies are exploring the potential of enzymes to treat cocaine and nicotine addiction. Increased understanding of the brain circuits involved in addiction is fostering the development of new treatments that directly target these neurobiological substrates. Preclinical studies have supported the potential efficacy of TMS, tDCS, and deep brain stimulation (DBS) techniques for the treatment of addiction. Ongoing research is exploring the efficacy of TMS for both nicotine and cocaine addiction, and the efficacy of tDCS in combination with cognitive behavioral therapy for pain and opioid use disorders in veterans. Clinical Trials Network (CTN): The CTN comprises 13 research nodes, two research coordinating centers, and more than 240 community treatment programs and/or medical settings in over 40 States plus the District of Columbia and Puerto Rico. Current initiatives are emphasizing research to develop and test strategies for the integration of SUD treatment, particularly for opioid use disorder (OUD), into mainstream general medical settings, embedding research in clinical practice, and enhancing capacity to leverage electronic health record (EHR) data in research studies. Through collaborations with clinical investigators, the CTN evaluates research based strategies needed for the integrated management of patients with substance misuse/SUD in general medical settings and linked specialty care treatment settings. The CTN develops and tests the feasibility and effectiveness, as well as implementation strategies and health system approaches for addressing SUDs and related disorders, such as comorbid mental health disorders and HIV, in diverse patient populations. The CTN is currently conducting studies evaluating: 1) a comparison of Vivitrol® (extended-release naltrexone) to Suboxone® (buprenorphine and naloxone) Sublingual Film for patients addicted to heroin or other opioids, including prescription pain relievers; 2) a linkage-to-care intervention for HIV/Hepatitis C Virus co-infected patients with SUDs; and 3) the incorporation of common data elements for SUD screening and assessment into a widely used EHR. Research under development includes a trial to investigate the effectiveness and safety of a combination therapy of Vivitrol® plus Wellbutrin XL® (bupropion hydrochloride, extended-release tablets) for treatment of methamphetamine use disorder, as well as three studies to evaluate strategies for integrating OUD screening and treatment interventions into routine practice in emergency departments, primary care clinics, and pharmacies, respectively. Intramural Research Program (IRP): In addition to funding extramural scientists, NIDA also conducts research in high priority areas through our IRP. Intramural research at NIDA focuses on conducting cutting-edge research within a coordinated multidisciplinary framework to: 1) elucidate the nature of the addictive process; 2) evaluate the potential of emerging new therapies for SUDs, including pharmacological and non-pharmacological (e.g., psychosocial, biofeedback, brain stimulation technologies); and 3) describe the long-term consequences of drug use on systems and organs, with particular emphasis on the brain and its development, maturation, function, and structure. For example, the IRP is furthering SUD research by collaborating with pharmaceutical industry partners to study a potential medication that can decrease methamphetamine craving and by collaborating with researchers in Italy to study the efficacy of TMS for treatment of cocaine use disorders. In addition, IRP is working to understand the impact of long lasting deficits in the prefrontal cortex – an area of the brain that mediates decision making – caused by cocaine and heroin use. In an animal model, scientists can reverse this deficit by hyper-stimulating the prefrontal cortex for brief periods. This intervention is being developed as a possible therapy for addiction. The IRP is also working to develop clinically useful indicators (biomarkers) of addiction severity or treatment efficacy that will support the development of more effective treatments and discovery of novel treatment targets. IRP scientists are also working to better understand the factors that contribute to cravings and relapse. Memories of items, people, or environments that are present when addicted individuals take drugs become powerful cues that trigger them to relapse again and again. Scientists have shown that these memories are stored in specific patterns of neurons called neuronal ensembles in the brain. Researchers have been successful in inactivating these drug-related ensembles and related memories in animal models, and are developing similar procedures that might be used in humans to impair selectively harmful addiction memories. In addition, IRP scientists are developing a mobile health toolbox to collect data on the daily-life reality of addiction. These tools can support intensive assessments to help identify individual and environmental influences on drug craving and to understand when people are most vulnerable to relapse. One of the goals of this research is to deploy a mobile intervention that will automatically predict imminent drug use and deliver help just when a person needs it. Research Management and Support (RMS): RMS activities provide administrative, budgetary, logistical, and scientific support in the review, award, and monitoring of research grants, training awards, and research and development contracts. Additionally, the functions of RMS encompass strategic planning, coordination, and evaluation of NIDA’s programs, regulatory compliance, international coordination, and liaison with other Federal agencies, Congress, and the public. NIDA currently oversees more than 1,300 research grants and more than 70 research and development contracts. In addition to the infrastructure required to support research and training, NIDA also strives to provide evidence-based resources and educational materials about SUDs and to raise awareness of the science relating to cutting-edge issues such as opioid overdose prevention, marijuana research, synthetic drug trends, and MAT. The RMS portfolio also incorporates education and outreach activities to inform public health policy and practice by ensuring the institute is the primary trusted source for scientific information on drug use and addiction. NIDA is also committed to being at the forefront of training the next generation of innovative researchers by supporting both pre-doctoral and postdoctoral-level scientists interested in drug use and addiction research. These efforts focus on increasing the number of underrepresented scholars and researchers, including women and minorities, actively participating in addiction research through our outreach, and sponsored career development and research training opportunities. Common Fund – NIDA has a lead role for the Common Fund-supported Epigenomics Program, which is developing new research tools and technologies to accelerate our understanding of how chemical modifications to DNA regulate gene activity without altering the DNA sequence. NIDA also administers a data management center for the Common Fund Extracellular RNA Communication Program which aims to understand the role of extracellular RNA (exRNA) in health and disease; to develop a catalogue of exRNA in normal human body fluids; and to investigate the potential for using exRNAs as therapeutics or biomarkers of disease. Finally, the Institute administers grants investigating nuclear structures for the Common Fund 4D Nucleome program. NIDA and NINDS are co-leading a new Common Fund initiative on Mechanisms of Fatigue that seeks to understand the physiological and cellular mechanisms of fatigue, to develop standards for its measurement, and to establish a rational basis for its treatment. NIH Pain Consortium – NIDA is the lead on the NIH Pain Consortium Centers of Excellence in Pain Education (CoEPEs) to enhance patient outcomes by improving the education of healthcare professionals about pain and its treatment. NIDA also plays a lead role along with NINDS in the open pain repository, which aims to provide open-access prospective deidentified data on pain outcomes to clinical researchers. 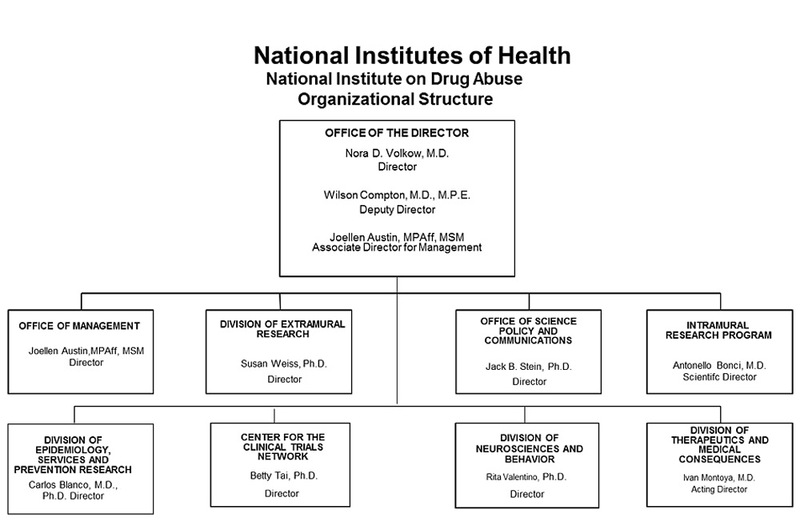 Collaborative Research on Addictions at NIH (CRAN) – NIDA, NIAAA, and the Division of Cancer Control and Population Sciences at NCI together make up CRAN, which was established in 2013 to add synergism and efficiency to the addiction research field. In FY 2015, CRAN released five funding announcements to promote collaborative research on addiction and research training. This included the initial funding opportunities for the Adolescent Brain Cognitive Development (ABCD) study described above (see program portrait) as well as for research aimed at novel behavioral targets to improve adolescent substance misuse prevention and treatment. In FY 2016, CRAN released three additional funding opportunity announcements for integrative research on polysubstance use and addiction and early-stage research to develop SUD treatments that address multiple substances. The All of Us Research Program – The President’s Precision Medicine Initiative and the All of Us Research Program aims to build a national research participant group, called a cohort, of 1 million or more Americans to expand our knowledge and practice of precision medicine. NIDA is participating on the Initiative Working Group to ensure that requirements related to protecting sensitive behavioral health treatment information are addressed so that people with SUDs can be fully included in the cohort. The President’s BRAIN (Brain Research through Advancing Innovative Neurotechnologies) Initiative – NIDA is also involved in this trans-agency effort that includes NIH, the National Science Foundation, and Defense Advanced Research Projects Agency. This initiative is building on recent advancements in neuroscience to create and apply new tools for producing dynamic pictures of the brain that show how individual brain cells and complex neural circuits interact. This new understanding will allow scientists to explore how the brain records, processes, uses, stores, and retrieves vast quantities of information, and will shed light on the complex links between brain function and behavior. The information gleaned from this initiative will provide an unprecedented view of the complex neural changes that occur in addiction, leading to new approaches for treating and preventing this and other brain diseases. NIH Blueprint – NIDA is the lead for the NIH Blueprint-supported Institutional Training Grants on Computational Neuroscience and Neuroimaging, and the Neuroscience Information Framework (a dynamic inventory of Web-based neuroscience resources, data, and tools for scientists and students). Download the full 2018 Fiscal Year Budget (PDF, 202KB). Beier KT, Steinberg EE, DeLoach KE, et al. Circuit Architecture of VTA Dopamine Neurons Revealed by Systematic Input–Output Mapping. Cell. 2015;162(3):622-634. doi:10.1016/j.cell.2015.07.015. Gremel CM, Chancey JH, Atwood BK, et al. Endocannabinoid Modulation of Orbitostriatal Circuits Gates Habit Formation. Neuron. 2016 Jun 15;90(6):1312-24. doi: 10.1016/j.neuron.2016.04.043. Bruce J, Fisher PA, Pears KC, Levine S. Morning Cortisol Levels in Preschool-Aged Foster Children: Differential Effects of Maltreatment Type. Developmental psychobiology. 2009;51(1):14-23. doi:10.1002/dev.20333. Bick J, Zhu T, Stamoulis C, Fox NA, Zeanah C, Nelson CA. A Randomized Clinical Trial of Foster Care as an Intervention for Early Institutionalization: Long Term Improvements in White Matter Microstructure. JAMA pediatrics. 2015;169(3):211-219. doi:10.1001/jamapediatrics.2014.3212. Centers for Disease Control and Prevention. (2016). CDC Wonder: Multiple cause of death 1999 - 2014. Retrieved from http://wonder.cdc.gov/wonder/help/mcd.html. Accessed on May 17, 2016. Center for Behavioral Health Statistics and Quality. (2016). Results from the 2015 National Survey on Drug Use and Health: Detailed tables. Rockville, MD: Substance Abuse and Mental Health Services Administration. Wurcel AG, Anderson JE, Chui KK, et al. Increasing Infectious Endocarditis Admissions Among Young People Who Inject Drugs. Open Forum Infect Dis. 2016 Jul 26;3(3):ofw157. Stevens MW, et al. First human study of a chimeric anti-methamphetamine monoclonal antibody in healthy volunteers. MAbs. 2014;6(6):1649-56. doi: 10.4161/19420862.2014.976431. Gilgun-Sherki Y, et al. Placebo-controlled evaluation of a bioengineered, cocaine-metabolizing fusion protein, TV-1380 (AlbuBChE), in the treatment of cocaine dependence. Drug Alcohol Depend. 2016 Sep 1;166:13-20. doi: 10.1016/j.drugalcdep.2016.05.019.